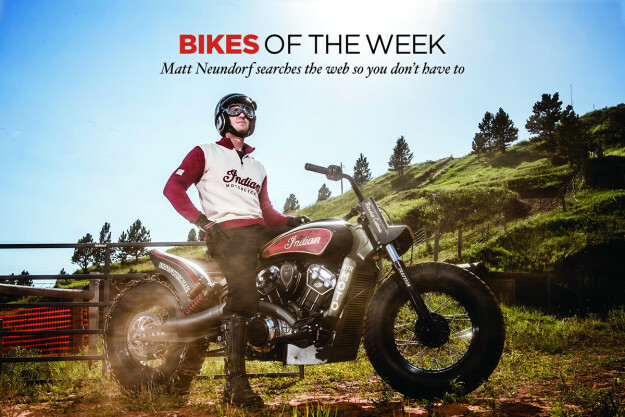 Indian Scout: The Black Hills Beast Built as a showpiece for this year’s Sturgis Motorcycle Rally, the Black Hills Beast is a hill climbing hellion—with enough attitude to keep the bar and shield crowd in check. Unbelievably, this modified Indian Motorcycles Scout from Doug Siddins and Nick Jaquez started out with some simple bolt-on parts from the Indian catalogue. Of course, things escalated from there. 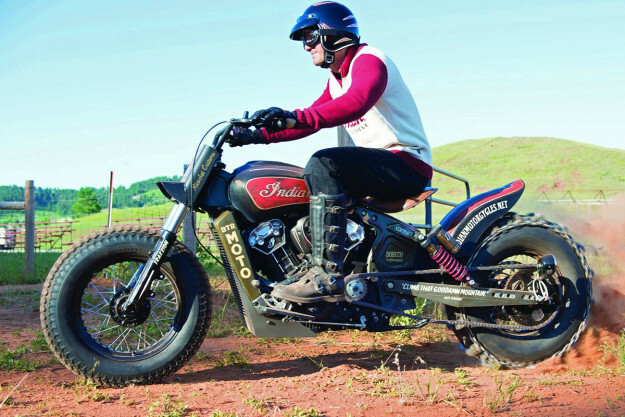 The call from Indian was to “build a hill climber,” so Doug and Nick went to work by stretching a swing arm and adding chunky, chain-wrapped rubber to the rear. New tailor-made bars were installed up front, along with a number plate with integrated LED lights. The final touch was a new set of pipes to make sure every one of the Scout’s hundred angry horses could be heard throughout the Black Hills. 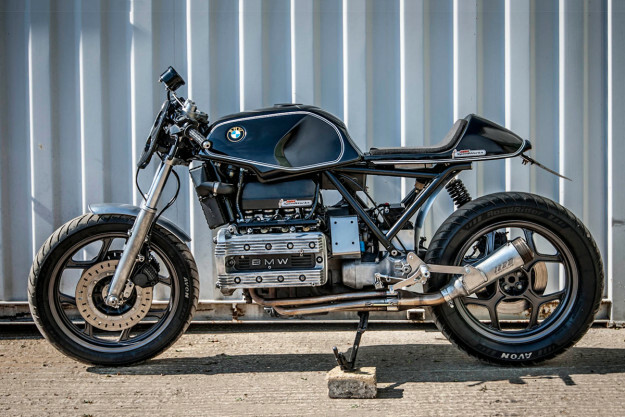 BMW K100 TT Cafe Racer by BSK Speedworks You might say motorcycles are a family tradition for BSK Speedworks owner Ben Kingham. His grandfather owned one of the first bike shops in the USA, and Ben and his father continued the legacy by building and racing their own creations in vintage events. Now Ben’s shop is turning out some of the prettiest K-Series builds going—just a few blocks from his grandfather’s original shop locale. The BMW K100 was one of the first bikes to feature fuel injection. But mapping and tuning a 30+ year old ECU can be an exercise in futility. 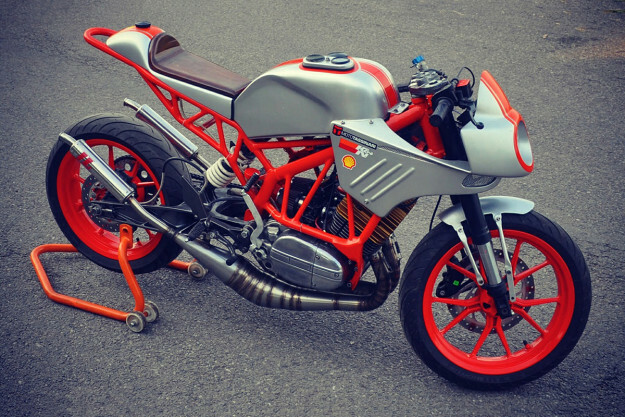 BSK specializes in transplanting modern ECUs into inline Bavarians, and this TT Cafe Racer is the latest example of their expertise. Built as a homage to Georg Meier’s 1939 TT winner, this K-series has had its frame chopped, its suspension swapped (for longer travel out back), clip-ons added, and a set of in-house BSK rearsets fitted. It’s an extremely clean build and, thanks to deft tuning, runs with the best of them. Eagle Cross MKI by Bruno Birbes Bruno Birbes is a Dakar Rally veteran. He made it to Stage 4 on a BMW in 1987 before injuries forced retirement, and completed the 1994 campaign in a truck in 10th place. So the inspiration behind his oddball Guzzi makes sense. Beginning with an omni-capable Moto Guzzi Stelvio, Birbes went to work stripping unnecessary bulk and heft. The modern amenities of a big ADV bike serve no purpose for speed, so approximately 50kg of luxuries are gone. There’s a one-off tank with a svelte waistline more in tune with the demands of desert riding, a custom exhaust, and thick chunky rubber. From a distance it looks like a supermotard with an identity crisis, but up close, Birbes’ detail work shines. If Ewan McGregor had laid eyes on this beast, The Long Way Round may have looked very different—and ended in half the time. Royal Enfield 350 Thunderbird by Bull City Customs They’re based in New Delhi, India, so it’s no surprise that Reginald Hilt of Bull City Customs favors Royal Enfields for his builds. 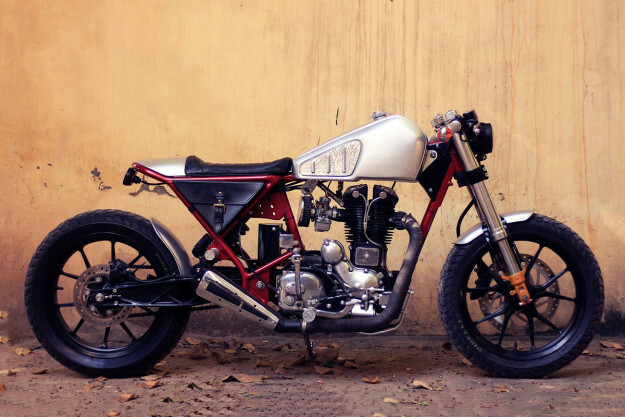 For this latest creation, Reginald reworked a 350 Thunderbird into a sinister Brat-style cafe racer. The rear sub-frame was tweaked to allow for the custom, stretched swingarm and monoshock suspension, and then painted crimson. That deep garnet pigment draws eyes like moths to a flame, set off by the champagne-silver paint on the custom tail and the angular, one-off tank. The 346cc twin-spark thumper powering this brat remains mostly stock though—save for a free-breathing intake and shielded exhaust. Although, I get the feeling from the well-worn pipe wrap, this Bird still thunders. RD Duke by Inline3 Start talking about the good old days of 2-stroke, and the nostalgia will fill a room quicker than the smell of mixed gas in the pits. Just eavesdropping on an “angry can of bees” at full tilt in the distance is enough to cover any pistonhead’s body in goose bumps. This love of every other stroke being a power stroke is precisely why Chandigarh, India based Aseem Singh Pawar envisioned giving new life to an old favorite. Of course, with an University education in design, simply restoring an old oil-burner wasn’t enough. 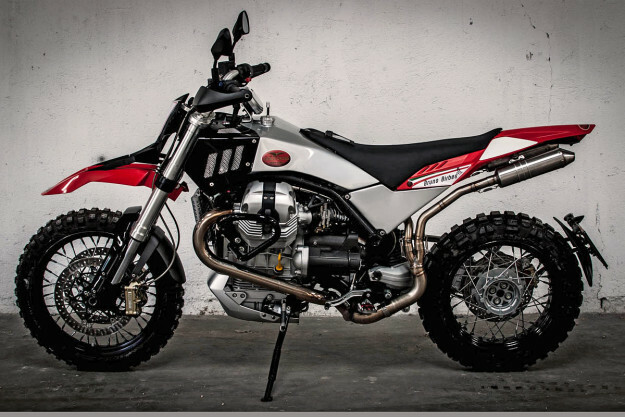 Enter the RD Duke: a hybrid between a Yamaha RD350 and a KTM Duke. What sounded simple was far from it, and the project took Aseem over three months just to fabricate effective engine mounts. Learning about his limitations but sticking with his design, Aseem enlisted the help of local experts to translate his ethereal shapes into sheet metal reality. The result is nothing short of staggering. Aseem has since begun courses in metal work with hopes of making Inline3 one of the next big names in the Indian custom bike world. We’ll be watching. 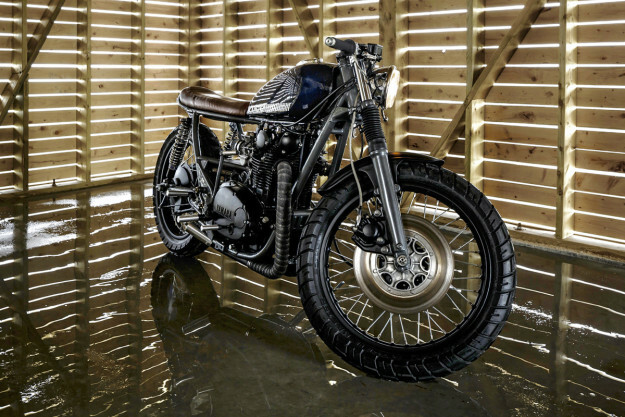 Yamaha XS650 by KickMoto When the call came in that a friend had “a few XS650s squirrelled away in his mom’s basement,” Nova Scotia-based KickMoto got down to business. This donor bike, a 1981 Yamaha XS650, was the best of the bunch—but it still needed major work. Previous mods and years of inactivity had left it a little lacking in every department. Stripped bare, the rebuild began by deburring the frame and welding in a rear hoop. The front forks were shortened and rear shocks swapped for Hagons, to give XS650 its fighting stance. A set of spoked wheels from a 1972 XS2 were fitted and the engine was re-wired to be kick-start only—a KickMoto signature. This cleaned things up even more, so the bespoke details could stand out. The matching exhaust tips and foot pegs are all in-house, lathe-turned and absolutely exquisite. The custom seat, flush-mount LED rear lights and custom battery box mounted just above the swingarm, finish off this impressive build. Oh Canada, indeed.